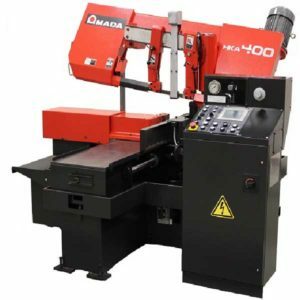 Amada Band Saws - Texmac Inc. Compared with other circular saw machines of the type, the fully automatic CM-75 CNC machine provides maximum cutting efficiency with top measurement accuracy. The use of a 2 mm wide circular saw with sintered carbide directional edge combined with a mist cutting fluid system ensures smoothest cutting surface without any edges and minimum broke. The saw rotational speed is smoothly controlled while an operator-friendly control panel facilitates operation. A feed magazine and automated first cut and broke separation function ensure high performance operation in a continuous cycle. 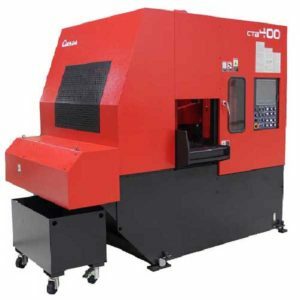 Cutting process parameters and combinations of different cut lengths and volumes can be stored in a computer memory, which makes the machine a perfect choice for both mass and small-batch production. The Model CTB400 band Saw Machine is developed for high production, accuracy, and economic cutting. 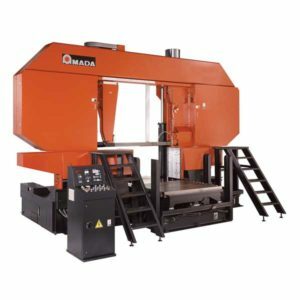 This state of the art machine is specifically designed to use the multifaceted Amada carbide band saw blade. 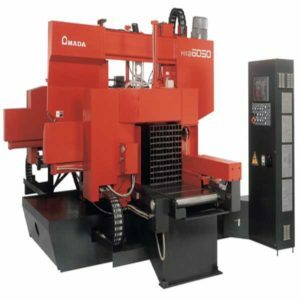 The combination of these two has achieved an excess of 95cm²/min cutting rates, surface finishes in the range of 62 RMS while holding accuracy’s well within the + – 0.05/mm of diameter. The world’s first CNC OPTIMAL CUTTING CONTROL (patent pending) presets feeds and speeds according to material specification. Extremely rigid construction for large capacity cutting of all types of metals economically and efficiently. 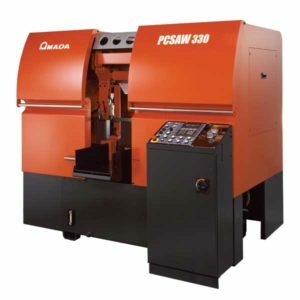 Miter Cutting Band Saw specifically designed for cutting structural steel sections. Circular Saw Machines. 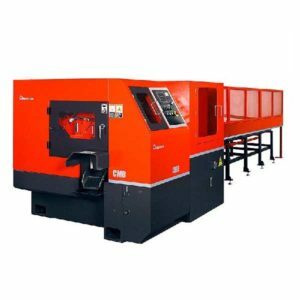 High productivity, accuracy and excellent surface finishes are only three achievements of many that will be constant when using the Amada CMB series sawing systems. 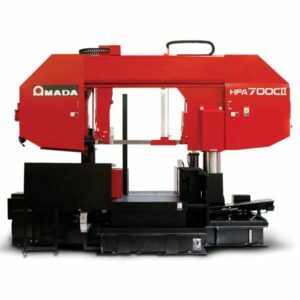 Combining state of the art innovations with Amada’s years of engineering experience will assure higher levels of accomplishments in metal sawing. Pulse Cutting Band Saw. Latest innovation in metal sawing. Remarkably Increases Productivity. Single pulse cutting cancels the vibrations that occur during the penetration force. This technology decreases cutting resistance while increasing blade life and cutting rates. Increased blade life is now guaranteed without sacrificing productivity.